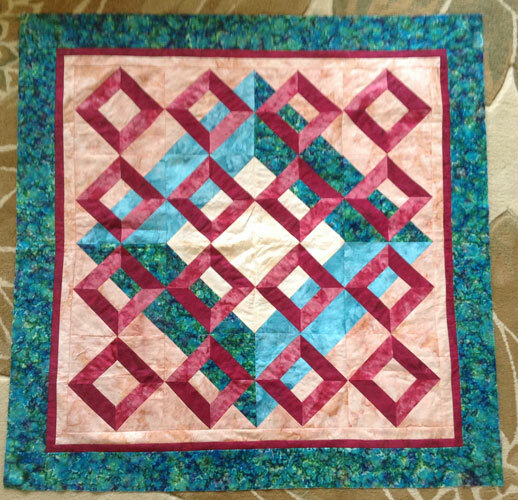 Karen Nickelson found this orphaned wallhanging at the Goodwill. Felt like the very light center looked like a bullseye, a distraction from the beautiful colors. Hummm! Here’s her solution. She chose Shiva Iridescent Paintstiks and a stencil to help add some interest, texture and color to the center. Helped to pull the piece together. 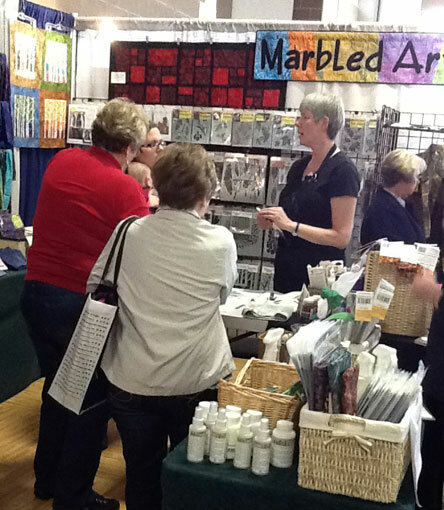 And yes she got the paintstiks and stencil from www.marbled-arts.com Can’t wait to see what it look like quilted. Karen Nickelson has been at it again. 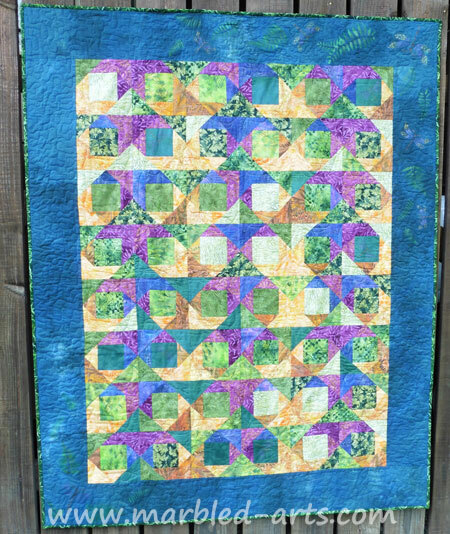 She used one of my Snow Dyed Fabrics, a Payne’s Gray Paintstik and a stencil to create this table runner. 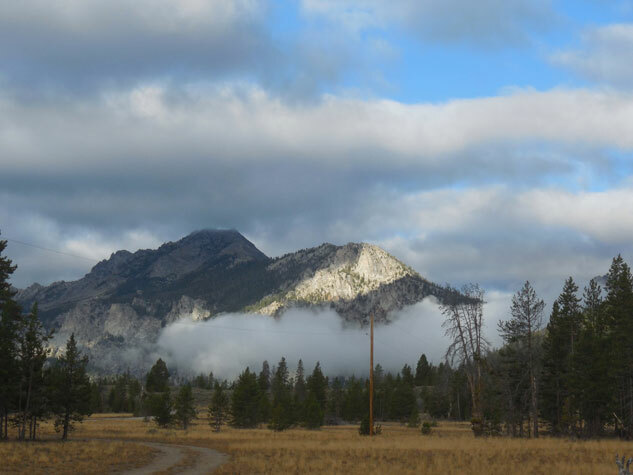 Karen Nickelson made this wall-hanging after visiting the Sawtooth Mountains in Idaho this Summer. She worked from a couple of photos. I love the reflection in the lake and the clouds in the mountains. Take note of the dead snags in the foreground of this photo. Karen opened almost every piece of snow dyed fabric I had. We hung different candidates on the outside of my booth wall (had a corner). We looked at the different pieces for three days. This one was the winner. 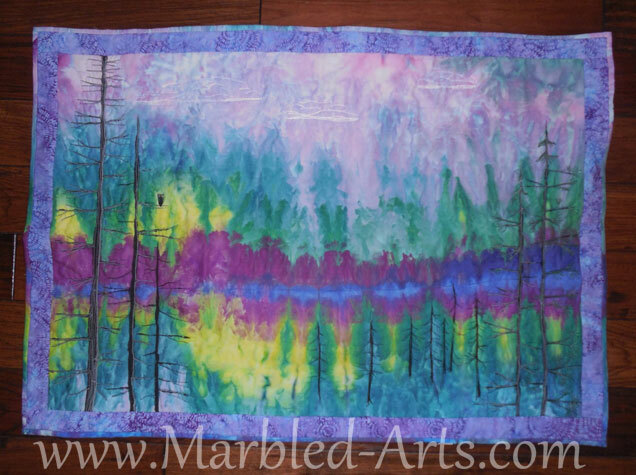 Karen used Blue painters tape and Payne’s Gray Paintstik to create the silhouette of the trees and added a little thread work to give the trees texture. 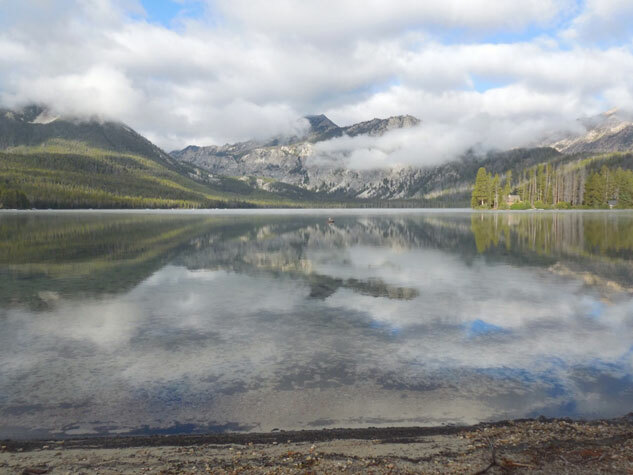 I love the fact that she didn’t try to do an exact replica of the photo, but gave you the look and feel of the mountains, lake reflection, clouds and trees. 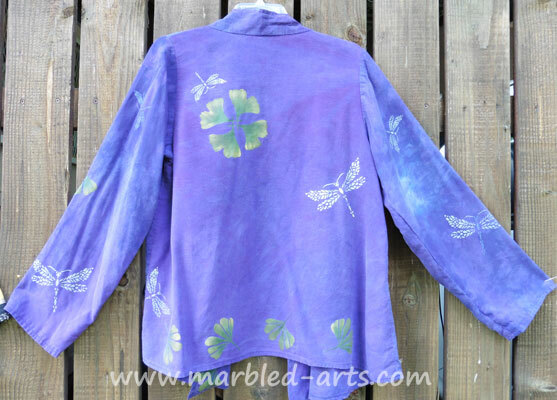 The Dragonfly and Ginkgo Leaf Jacket is one of the first pieces of clothing I made using paintstiks and stencils. It was the most nerve racking by far. 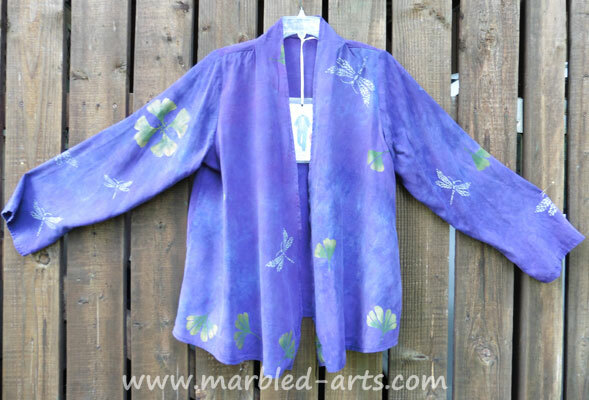 I had just enough Hand Dyed Fabric to make the jacket, any mistakes could have been fatal. The dragonflies are all done using Iridescent Silver, with a few having Iridescent Dark Blue bodies. 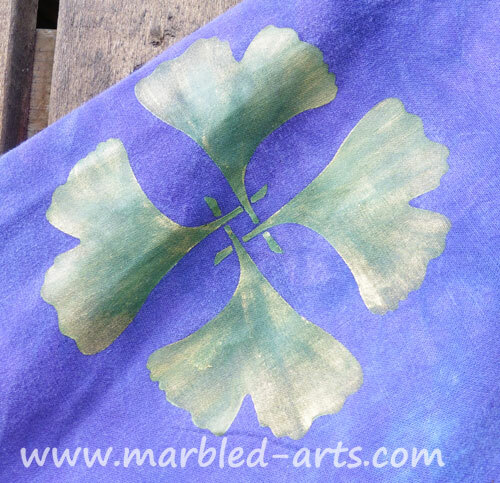 The Ginkgo leaves were more of a challenge. Matte Beige was used as a primer, followed by Matte Sap Green and Meadow Green. I used Iridescent Gold for a light wash over to top to add just a little sparkle. 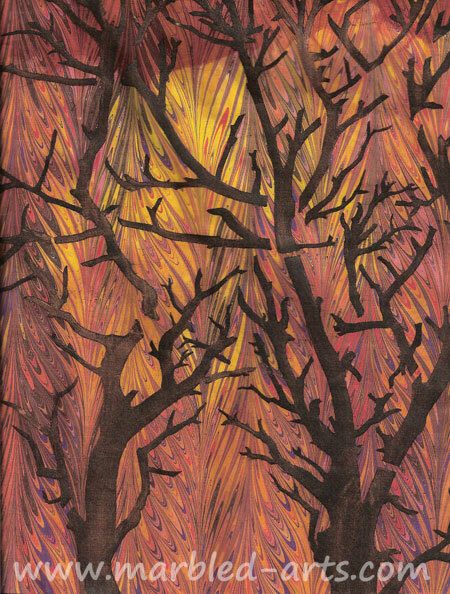 Fire Tree was inspired by wildfires, the colors and intensity of the wildfires are breathtaking and frightening at the same moment. Yes, I was up-close to several wildfires during my years of guiding in Alaska. It is a sight that stays with you. 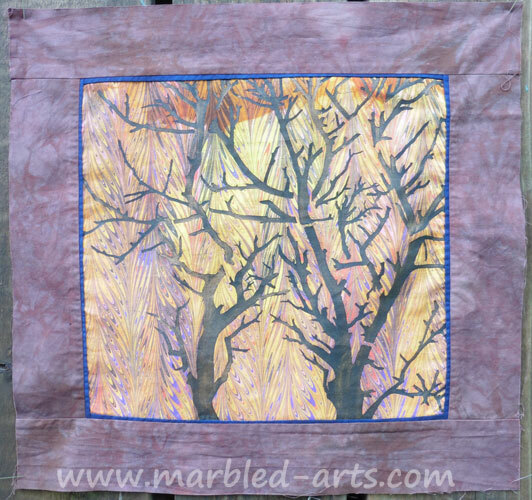 Fire Tree started with a Hand Marbled Fat Quarter of Fire in Feathers Design. Branches Reversed 12″ x 12″ is the stencil with three paintstik colors, Matte Ivory Black, Chocolate or Asphaltum (I don’t remember which, Dark Brown is the key) and Iridescent Gold. Started by putting down a very light layer of Ivory Black as a primer, followed by a nice opaque layer of Dark Brown and finally a light wash of IR Gold to give depth and sparkle. 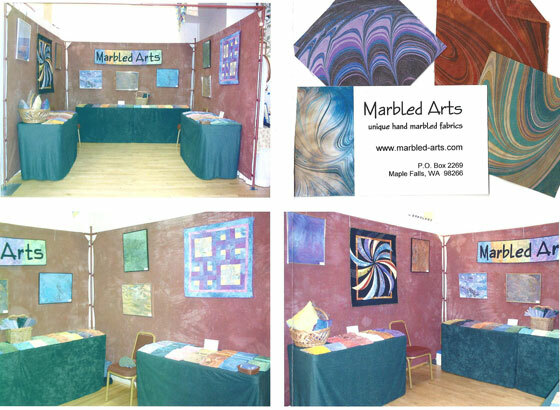 One of these days quilting will happen, but currently I am far to busy making more Hand Marbled Fabric for you. I was asked for photos of some of my Paintstik Projects, only to discovered I am a bit behind at posting a few things. 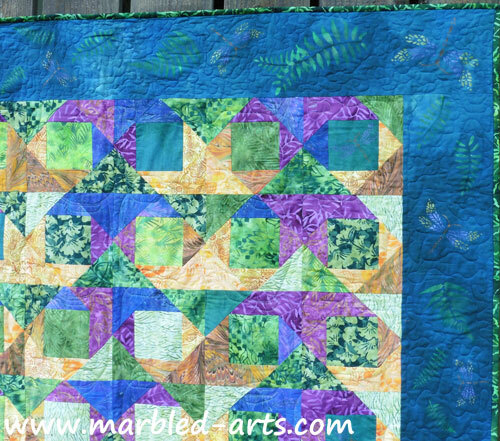 Spring Maze/Autumn Haze is two blocks and just by changing the setting you can create two completely different quilts. This is the Spring Maze version. 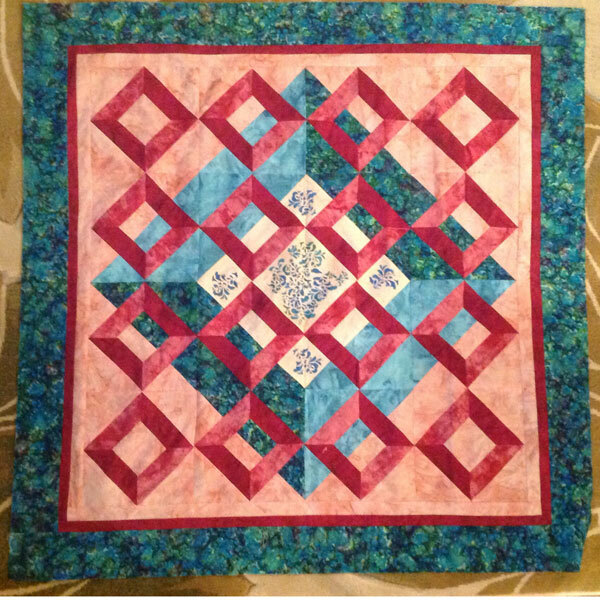 I concluded that the blocks were so bright and bold that hand dye border was required. My obsession with Paintstiks continues. Spring Maze looked very organic, a field of wildflowers in full bloom. 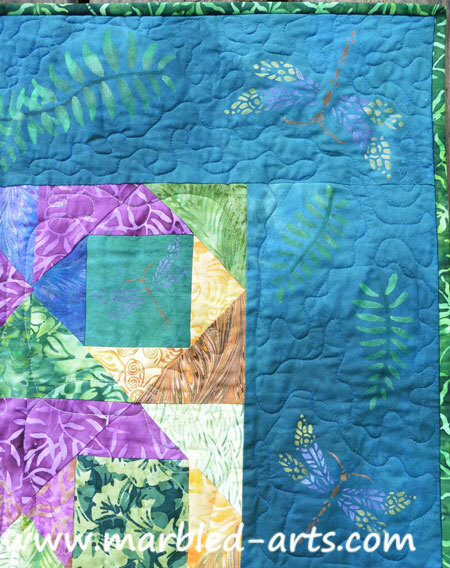 You will find ferns and dragonflies in two corners and a few little dragon flies randomly in the several center of the blocks. I love it when a plan comes together. The fern and dragonflies added a wonderful little something to my wildflower garden. That was then and this is now! Misc. Supplies – Not necessary, but sure make life more fun. Apply paint color using a gentle circular motion or dabbing motion. Clean Up – Brush as much excess paint onto a paper towel. Dip in your cleaner. Work Paint out with a paper towel. Repeat until brush is clean. Then wash brushes by hand with soap and cool water. If you are using 404 on your stencil, the formula has changed and you will need Rubbing Alcohol to clean the sticky stuff off of the stencil. 404 Cleanup – Old formula cleans up with Citra-Solv, Murphy Oil Soap or Brush Cleaner. New formula cleans up using Rubbing Alcohol. 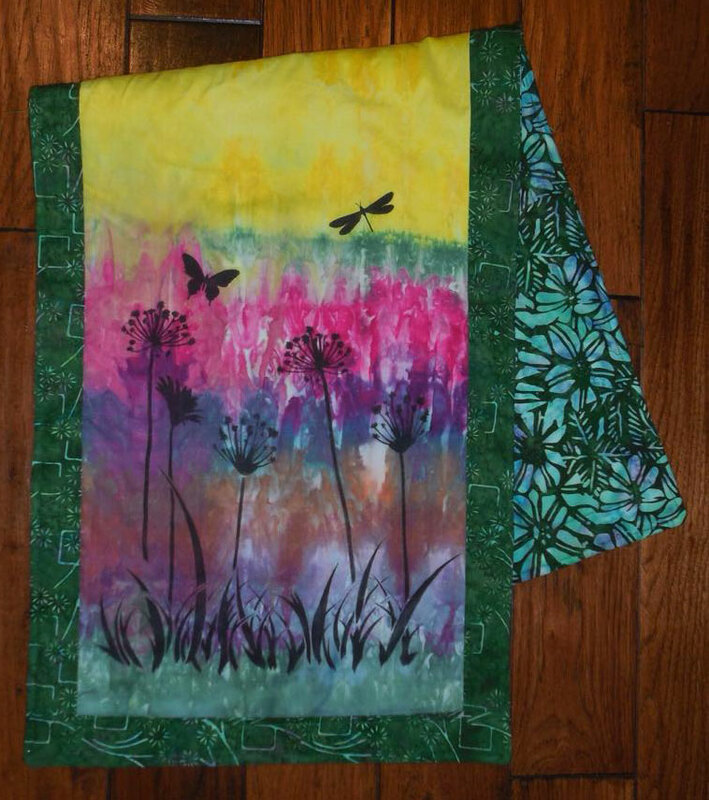 Heat Setting – Allow the painted fabric to dry for 3-5 days, and then heat-set to make the colors permanent. Set your iron to the proper setting for the fabric. Place a piece Parchment Paper on your ironing surface, put the fabric paint-side down on the parchment Paper and press. Take your time. When you think you have heat-set long enough, that much longer. You cannot over heat-set, but to under heat-set is really bad.